Thus far, I'm not gushing with praise with PPS 8, but there is promise. I still need to explore the added controls for effects, too. PPS 8 is beta after all. I hope there'll be improvements. The two things I've been interested in with PPS 8 is the Perfect Eraser and the inclusion of Perfect Focus in the effects module. I'm on a Mac, it went fine. Peacefully coexists with Perfect Photo Suite 7. PPS 8 found Aperture fine and installed the plug-ins. I tried this on an image where I wanted distracting trees to go away. Simply put, it didn't really work well. The image below shows what I started with. I wanted the trees jutting into the white void of sky to be removed. After several minutes of playing with the eraser, the image below is the best I could get. Not great. What the Perfect Eraser did remove, I could have done with a traditional clone tool. 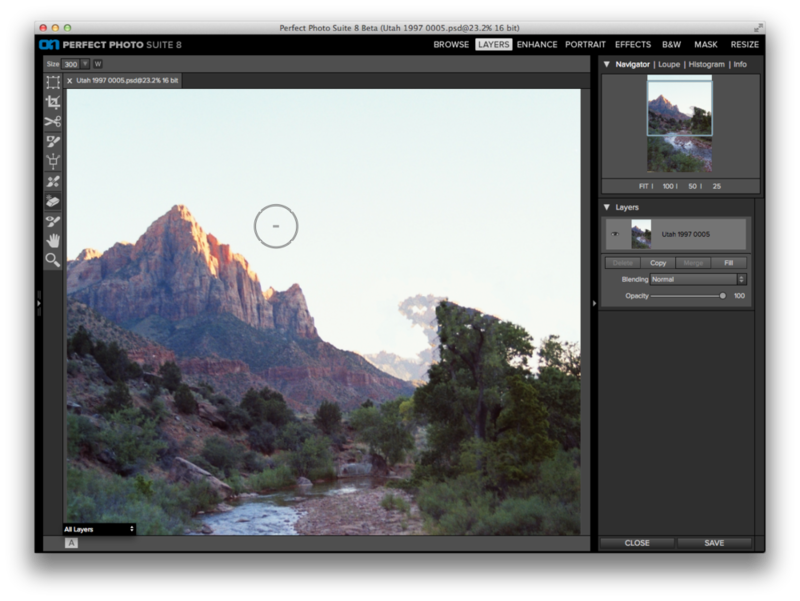 Perfect Focus is no more, and the functions are folded into the "Lens Blur" category in the Effects module. This is pretty nice. I'm still getting used to the updated masking bug design. But it's convenient to have the focus features in Effects. One less tool to jump to. And the motion blur options are very promising. Some fiddling with adding motion to a cloudy sky (right). Motion blur added ... nice! My MacBook Pro trackpad scrolling isn't resizing the brush (and yes, I set this up in the preferences).